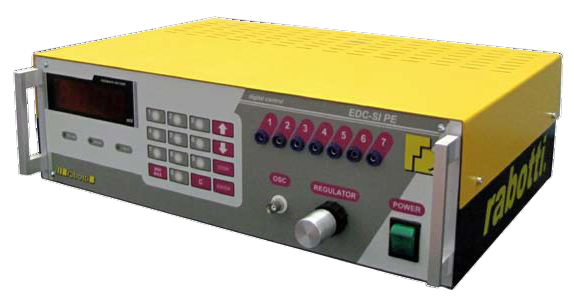 EDC SI-VE/IR is an obligatory electronic instrument for controlling, setting, adjusting and testing the functions of the systems “Electronic Diesel Control” fitted on the electronic rotary injection pumps. The EDC devices are integrated parts of the electronic injection systems of cars and commercial vehicles produced by most of the vehicles manufacturers, just to name a few: ALFA ROMEO, AUDI, BMW, CITROEN, FIAT, LANCIA, MERCEDES, PEUGEOT, ROVER, etc. The EDC SI-VE/IR generates a piloting signal suitable for the EDC system of the injection pump according to the digital setting made by the operator and, at the same time, shows the return signal voltage corresponding to the position of the electromagnetic actuator. The EDC SI-VE/IR also supplies the piloting signal for the advance electrovalve. All outlet connections of the pumps are easily accessible by the operator thanks to the connectors on the front panel suitable to all digital or analogical millimetres found on the market, thus permitting the electrical control on the actuator, full run of the transducer and the fuel temperature sensor. The modern digital system of the new EDC SI-VE/IR incorporates spy lamps signalling the type of setting made by the operator and the functioning faults (such as short circuits at the outlets). All piloting systems are protected against short circuits and overloads. The EDC SI-VE/IR can be used continuously for undetermined periods without undergoing any damages or over heating. More over the EDC SI-VE/IR is built in a standard modular form and size that can be used as a stand-alone unit or integrated in complex cabinets or trolleys.